Anna Skoog had been addicted to sugar since childhood and with time the pounds piled up on her. She tried to get comfortable with her weight, but after being accepted to art school the excess weight started to feel like a big obstacle. She decided to do something about her weight issues once and for all. She was skeptical about the LCHF diet (low-carb, high-fat) but having heard a lot about it she decided to try it for a month. I’ve followed your blog since I went on LCHF 1.5 years ago and have so far lost 84 lbs (38 kg)!!! 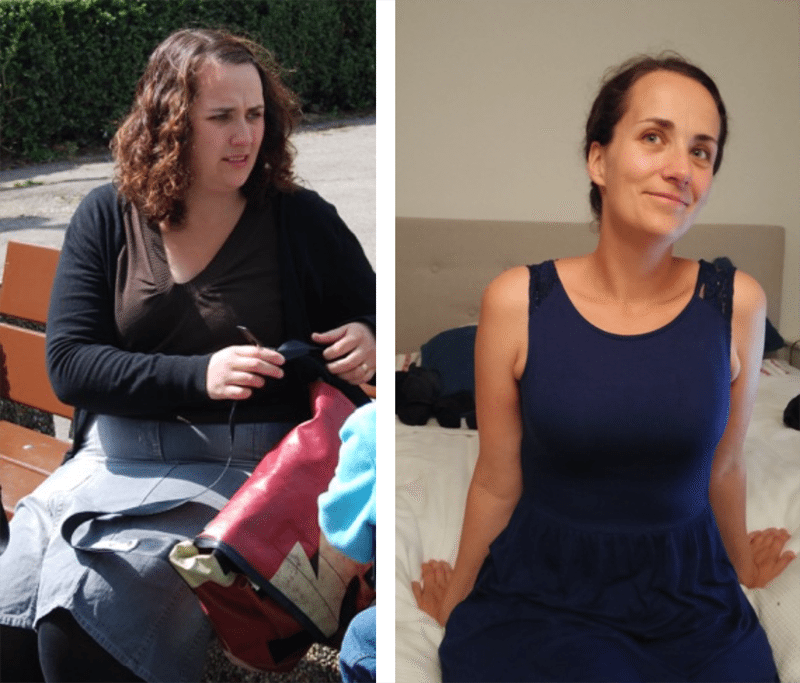 Recently, an article about me and my weight journey at LCHF.de was published (in German). I thought perhaps more people will read about my weight journey here and get inspired in the same way that I have been by all the success stories on your website. In addition I’m trying to spread knowledge about LCHF here in Switzerland where I live. They haven’t come that far here. Ever since childhood I have sought comfort in sugar. If I was sad or happy, I always found an occasion to eat sugar. I packed on the pounds slowly but surely and after four pregnancies and several attempts to lose weight I had given up, 254 lbs (115 kg) heavy. I remember that I said to myself that I was that overweight person and that I was fine with that. But of course I wasn’t fine with it, it was just a defense and a wall I had put up for myself. As I had been accepted to an art school with very high demands for performance, I realized that my weight presented a big obstacle. The only thing I thought about prior to a presentation to my class was how I should stand and dress to look my thinnest. So on New Year’s Eve 2013 I made a decision, I had to lose weight once and for all. As I’m Swedish I had heard about LCHF through media, but at first I was very skeptical. We’ve all been told to eat less fat and not more. But I thought that there could be no harm in trying so I gave it a month. I saw results after a week already and had lost 5 lbs (2 kg), and this has continued. In the beginning it was hard of course, I went from eating 8 oz (200 g) chocolate daily to nothing. But I hung in there and I remember how I woke up after 2–3 weeks and felt: here’s the turning point. I got energy that I didn’t know existed before and the pounds melted off in a fairly rapid pace. With the weight loss the desire to move came and I’ve gone from a few walks per week to exercising at the gym regularly. I didn’t grow up in a home where cooking was important but just a necessary chore. It has always been important to me to convey the importance of good food and the dinner-table discussions to my kids. With the limited carbohydrate intake I’ve found a lot more creativity and a passion for cooking. I have now finished my art school class and am working on launching a new business about food and recipes. I’ve so far lost 84 lbs (38 kg), from 254 lbs (115 kg) to 170 lbs (77 kg) and I have a few more pounds to lose, but it’s ok if it takes time. I love food and wine, coffee and dark chocolate and don’t want to sacrifice the good things in life. I’m not stressed and meanwhile I’m enjoying being able to play soccer with my kids and exhaust myself at the gym. My husband has also lost 55 lbs (25 kg). Thus, together we’ve lost 139 lbs (63 kg) during these 1.5 years and have gotten entirely new lives and interests! It’s so much easier to live without the extra weight. Imagine if I could get people to understand this. If I can do this, anyone can. It would be great if I could inspire someone else! Take the 2-week challenge to get started right away. Congratulations to your and your husband’s impressive weight loss, Anna! Awesome inspiring story. Just goes to show. Every single story like this gets my motivation up and gets me excited for the future of my health. I have many family members I'm working on and need to show them my own health to convince them this is the way they should be living. That is my strongest motivation. I don't have huge amounts to lose. 40 pounds or so. But this is so inspiring. Awesome work Anna. Great job! I enjoy reading the success stories. Mostly because I don't have one to tell yet!! SO they're very encouraging! Thanks! Miss Peggy, I am so sorry to see you are depressed. I hope you can try this. It's helped me, I have lost weight and have more energy. My blood sugar doesn't drop out on me. It seems so odd to eat no fruit or candy but it doesn't even bother me any more. Maybe sugar free jello with whipped cream would replace pudding. Just try. Good luck God bless you. I have Fibro and arthritis, however I can control the pain a lot more if my sugar and fruit intake is low and my protein is adequate and my natural fat level is high. I only needed to lose about 20 Lb, and I lost that, but it was more important that I got healthier. If possible, and no one else in your household objects, could you banish sugar and grain junk from your house? There is a scripture saying don't look at wine when it sparkles(if you need to avoid it). Seeing is wanting, so avoid looking at such. Been LCHF for 2 years at age 61. Was not much overweight but have lost 10kg. What has astounded me though is the energy I now have, as highlighted in Anna's post. Though deskbound at work, I have enough energy to do physical work all weekend in setting up my new home. Walking amongst the rafters above the ceiling, chopping down and clearing dead trees, woodwork at my workbench and having started running 18 months ago, am going faster and faster in my club time trials and Saturday morning races. Just love it!! Not had this much energy since I was 40 as far as I can remember. BTW, had my cholesterol tested twice - no change! Another BTW, had a spinal fusion 25 years ago - since I started running no further narrowing of the inter-vertebra gaps. I have been struggling with my weight since having my last son 17 years ago. About 15 years ago I had a gastric bypass and it was very successful. I lost 80 lbs (236 to 162) and was very happy. Four years ago I slowly started putting on a little weight at a time and when I hit the 25 lb mark I told myself I could not let that happen. I tried the traditional diet and exercise gig but it had not worked for me in the past and was again not successful. My two best friends and I decided to go on HCG (pellets). I stuck by it 100%. In 3 weeks I had lost a whopping 26 pounds and was looking and feeling great! That stayed off for about a year. Work got extremely stressful and my workouts at the gym were dwindling quickly. I when I reached 199 I again did something drastic. I traveled to one of 3 doctors in Northern California and committed to the HCG injection diet. Again, it worked. I lost 23 pounds. My doctor told me that I could do another 3 weeks and I was really excited. I was to start the last week of September 2014. All of September I felt tired, although my lifestyle is extremely busy and tiring, but this was different. I just couldn't get over it. I started the diet thinking it would help me and figured, since I work around teenagers all day, I had picked up a bug that I just couldn't shake. After a week of the diet, on my wedding anniversary, I decided to go to the doctor to see if I could get rid of this "bug". At this time I was so exhausted that I had to sit back down after taking a shower. I did not have a bug....I had a bleeding ulcer and I had lost 73% of my blood supply! I was hospitalized that night and over the course of the next week had surgery and was given 3 blood transfusions before my blood count would increase. I was not allowed to go back to work for 7 weeks after leaving the hospital, not allowed to do any exercise whatsoever, and was taking a lot of medicine to try and recover. The day I left the hospital I weighed 179. Since then, I have blown back up. I am now at 205. I was just released to start walking and using resistance bands two weeks ago. I started the HCG injections again but was not allowed to do the 500 calorie diet. I purchased a FitBit and synced with my very closest friends. This all began on June 23rd. I got diligent with my walking and average 5-7 miles daily. I felt great, lost 4 lbs the first week, and was coming out of my depression. Then BOOM! another obstacle. A heel spur. I tried to forget it and kept walking and doing my exercises until I couldn't get out of bed in the morning. The pain was horrible. Yesterday I hobbled to urgent care, took a chance at getting an appointment with the podiatrist (it worked), and was given a cortisone shot. I am off of it today and tomorrow I will be off to buy some doctor-recommended running shoes with inserts. My plan is to get back outside tomorrow for my walking plan. I guess I am telling you this long story to say that I have been looking for something better to help me get back to where I was before. I need a life plan. I will be 55 in August and am nowhere ready to be "old". I have read lots about your diet plan, have looked at the videos, and all sounds so very doable for me (someone who can stick to a 500 calorie diet with very limited food choices). I have to admit I am fearful about eating the fat and a lifetime of being told that "fat makes fat". The other thing I wonder is if it will work the same for me since I have a different digestive system? I don't see anything about pros or cons for those of us who have had that surgery. Can you advise me? Thanks and Congratulations!!! I have been following this blog for a few years. I had heard about the diet and thought my husband should try it because he was borderline diabetic and his cholesterol levels were high. He really wasn't overweight per se but he wanted to have muscle. Well, he has lost 25 pounds and kept it off (this is key), his A1C and fasting blood sugar is within normal range but his cholesterol is still a little elevated. He started by eating 20 grams a carbs a day and now he eat 50 grams a day. He does spill albumin in his urine. I'm wondering what that is all about; doctor is elusive on why. And thoughts or advice would be most appreciated. Is he doing strenius excersise? If, its normal to spill more albumin/protein in urin!